During long runs, when fatigue is setting in and energy levels are sinking fast, I often fantasise about a steady supply of sugar to fuel me on the way, some friendly encouragement to keep going and a welcome glass of something fizzy at the end. Well, I have now found that oasis in the runner’s desert. It’s called Women Run Strong and guess what? You too, can join in. 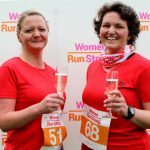 The next Women Run Strong event is being held in Edinburgh in the form of a 6km or 10km trail run on paths through Holyrood Park, on Sunday 30th October at 11am. The difference between this run and your usual 10km, or half marathon, is that it is a non-competitive, fun event for women only, with regular supplies of jelly babies dished out en route, by smiling marshals and a glass of Prosecco at the finish. 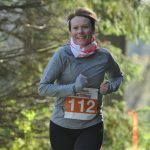 I had a fabulous day out at a similar event run by Women Run Strong in May, through the grounds of the Atholl Estates in Dunkeld. It was the little things which made it such a great occasion – being piped to ‘Flower of Scotland’ on the Loch side as we set off, regular jelly baby stations, bubby at the end and spot prizes. I ran the longer 11km route, after having initially opted for the shorter 6km run, proving that you can indeed push yourself further than you may have thought possible. Event Organiser, Avril Mahon Roberts, runs Women Run Strong, and has support from family and friends on the day of the events. It is now in its second year with the first run being held in Dunkeld in March 2015. She said ’Women Run Strong is a running event for women who love the outdoors, but also appreciate a little bit of pampering after the run. Have you ever come to the end of a great run and felt you want that fantastic feeling to continue for as long as possible? Everyone is sharing their good vibes and then you have to find your car in that far off car park and trudge off home alone. It’s happened to me and that’s why Women Run Strong is different. ‘Firstly this is not a race. There are no timing chips so no-one can be last. The small number of participants ensures a friendly atmosphere and no jostling and stress at the start, typical of larger runs. ‘The route is on paths through Holyrood, not on the road. There are great views, some mud, but not too much. For anyone more used to running on roads this is an ideal introduction to trail running, you experience the freedom and sense of adventure, without the anxiety of ‘where do I go now?’ The trail will be well-marked and well marshalled. You won’t get lost and if you’re a novice you will enjoy the personal support of the marshals as well as the jelly babies they hand out. ‘There are 6km and 10km options and everyone is welcome to run, jog or walk. You can even decide which route to take after you start and see how you feel. The 10km is challenging enough for any seasoned runner, again without the stress of a race. You can enjoy the views, take some photos and look forward to the bubbly,’ she said. It’s a four star, pampering experience even after the run is done. The Crowne Plaza Hotel is the race headquarters in Edinburgh and participants can book as extras, such as lunch, a post-run swim, spa treatments or overnight accommodation through the hotel. Avril is expecting a sell-out run on October 30th. There are only 140 places, so it is a small and exclusive event. ‘This ensures that everyone taking part feels supported and welcomed to the Women Run Strong tribe,’ said Avril. Describing Women Run Strong’s philosophy, she said ‘Women Run Strong is rooted in the belief that running brings joy, strength and courage. Women who run build their strength, and can run their lives, businesses and families with positive energy and courage. If you fancy joining the tribe, find out more and sign up through the Women Run Strong website, womenrunstrong.com. You can also find them on Facebook.